Most kids love music, but what do you do if you have a kid who loves to sing? By them one of the top 10 kids karaoke machines of course. Karaoke machines make one of the best gifts for kids as they are the perfect tool for keeping your kid entertained for hours on end. The key is finding the best kids karaoke machines around, the ones that are appropriate for your child’s age and the one that will let your kid sing along to their favorites! If your kid likes to sing along to their favorite tunes purchasing a kids karaoke machines makes sense. However, you don’t want just any old karaoke machine, you want the best. So, how do you know you are getting the best? Here are a few things to watch out for when picking the best kids karaoke machines. Even if you are only halfway listening to YouTube videos or the radio you are well aware that not all music is kid-friendly. Karaoke machines are a great idea, but you want to make sure the music on the machine is what you want your kids singing along too. Look for a kid’s karaoke machine that has kid-friendly music already installed or a machine that offers parental controls. Parental controls, even on Bluetooth options, allow you to filter the content so you can keep it age appropriate. We all know the main purpose of any karaoke machine is to sing along to your favorite tunes, but there is always more to the story. How your child plans to interact with the karaoke machine will determine what the best machine style is for them. Does your child like to sing and dance along with microphone in hand? Will they want to take the machine with them to friends houses to have hours of fun? Think about everything your child will do with the machine before deciding on the best one. This feature is something that you will want to consider, especially if you have teenagers. The ability to use Bluetooth with the karaoke machine allows kids to expand their music choices. With a Bluetooth connection and the ability to stream music the possibilities are almost endless. If you have young children and opt for a machine with Bluetooth abilities look for one that requires the use of a tablet, so you can have parental controls already in place for streaming content. One of the best things about the Memorex SingStand Karaoke System is the way it is built, the system is designed to look and feel like an ordinary microphone. With this unique karaoke system all of the amazing features have been built into the stand itself; namely, the speakers built into the base. An MP3 player or other device connects at the top of the stand and can rest inside a holder so your child can easily sing along with their favorite playlist. With the SingStand your child has auto voice controls so the background music doesn’t drown out the voice output. 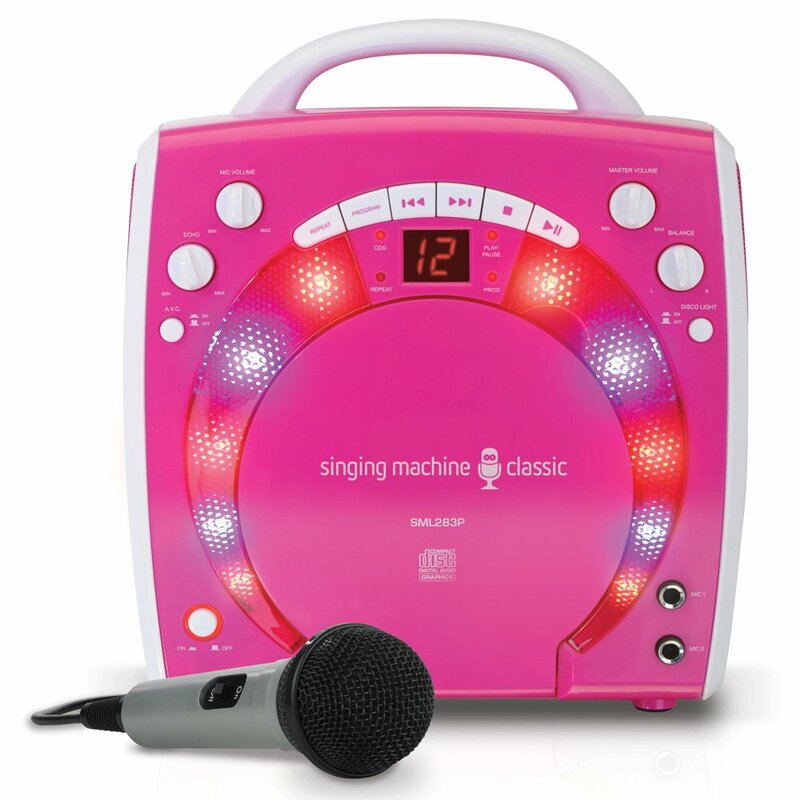 There is no doubt about it the Singing Machine SML385 is currently the best kids karaoke machine on the market. This machine has just about everything a kid could want in a karaoke machine. With the Bluetooth ability of the Singing Machine SML385 and an auxiliary output kids can use a tablet or other device to stream all of the latest music. The top-loading CD player plays music CDs and CDs that have been enhanced with lyric graphics. The built-in LED disco lighting comes complete with dimmer settings allowing kids to choose the right amount of light. 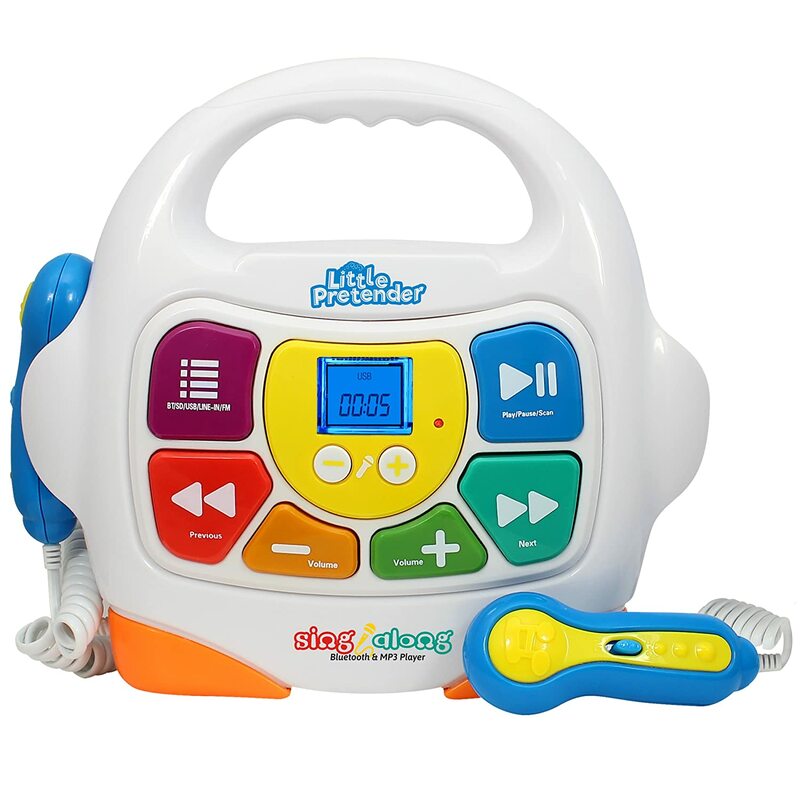 Two microphone jacks with volume controls allow your child to sing along with friends. 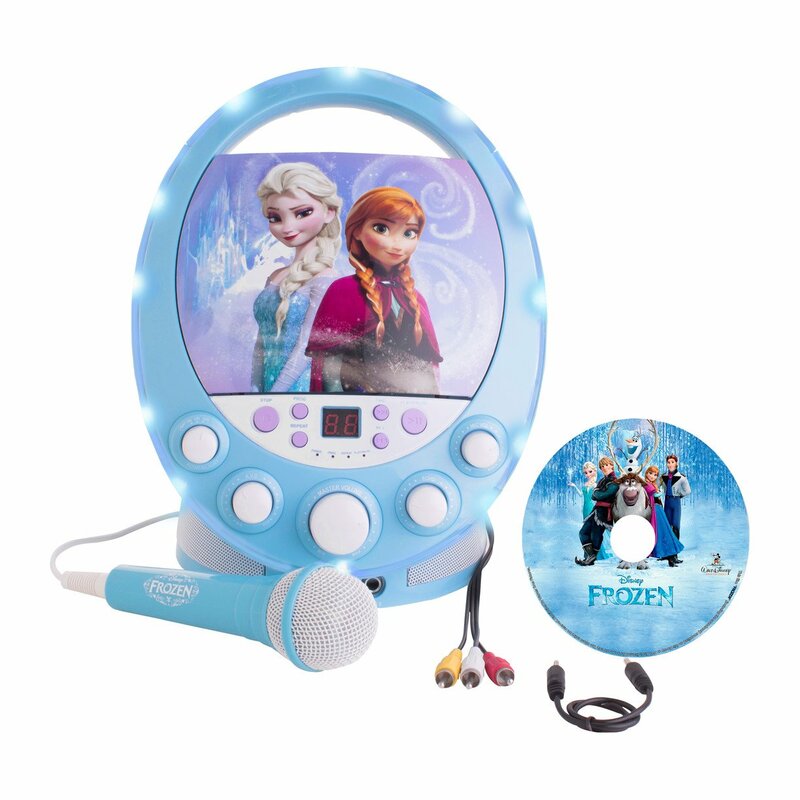 The Frozen Karaoke Machine offers a durable kid-friendly machine complete with flashing lights and enhanced vocal effects. The unit comes with a CD+G and a lyric booklet featuring the Frozen soundtrack, a hand-held microphone, AC Adapter, and AV cable. The Frozen Karaoke Machine plays CDS but provides other options for music including the ability to connect a tablet, iPod, iPhone, or iPad. With this unit, you can connect it to the TV for an amplified sound, plus your TV can scroll the lyrics, so you and your kids can easily follow along. An extra microphone can be purchased and used along with the microphone that comes with the unit. If you are looking for a machine that older kids will enjoy the iDance Sing Cube Bluetooth Speaker is an excellent choice. 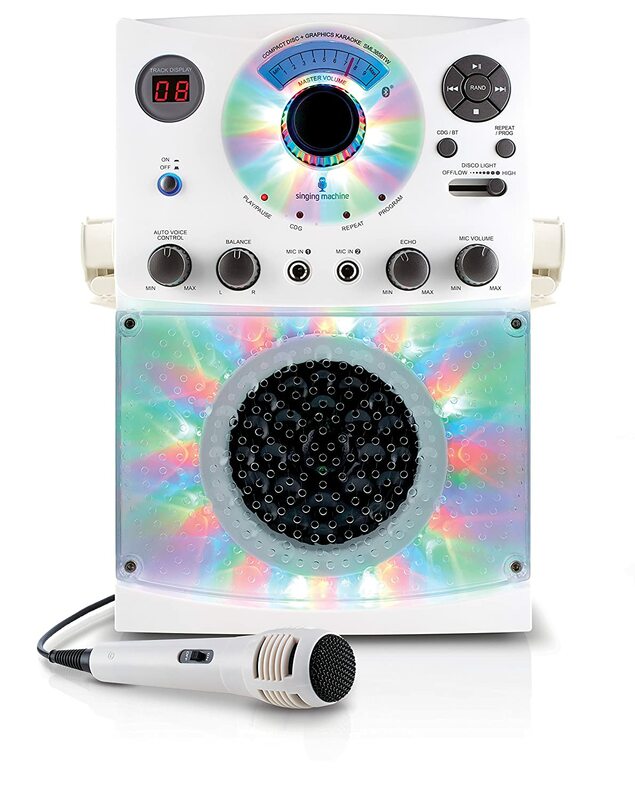 This karaoke machine comes equipped with a 50-watt subwoofer and speaker. The disco ball that sits on top of the machine projects spinning light patterns onto ceilings and walls based and can be synced to the music. 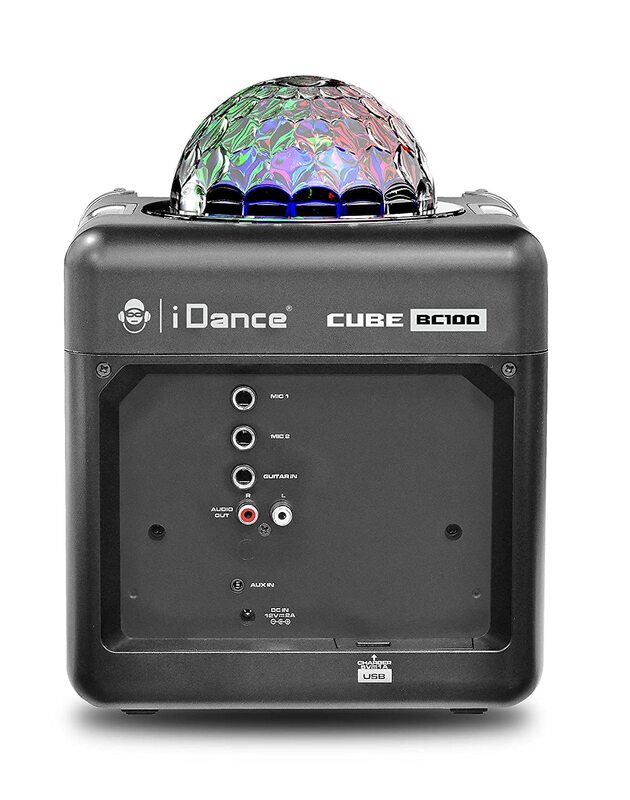 The iDance Sing Cube offers a USB input for connecting phones or other devices or you can connect your phone or tablet via Bluetooth for easy streaming. The iDance comes with one microphone, but two input jacks. The second input jack allows for an additional microphone, a second speaker, or even a guitar. If you are in the market for a lightweight and portable karaoke machine the Singing Machine SML-283P is an excellent choice. The machine is one of the simplest to use making it the perfect choice for children as young as three years old. The Singing Machine SML-283P offers plug-in-play fun with a front-loading CD player that will play ordinary CDs and CD+Gs. Two wired microphone jacks with separate volume controls allow for the best duets. With auto voice control and echo and balance controls to enhance the sounds, this machine has everything one needs to put on a show. With the Wireless Kids Karaoke Microphone, kids can sing and dance to their heart’s content as there are no wires tethering them to a speaker. 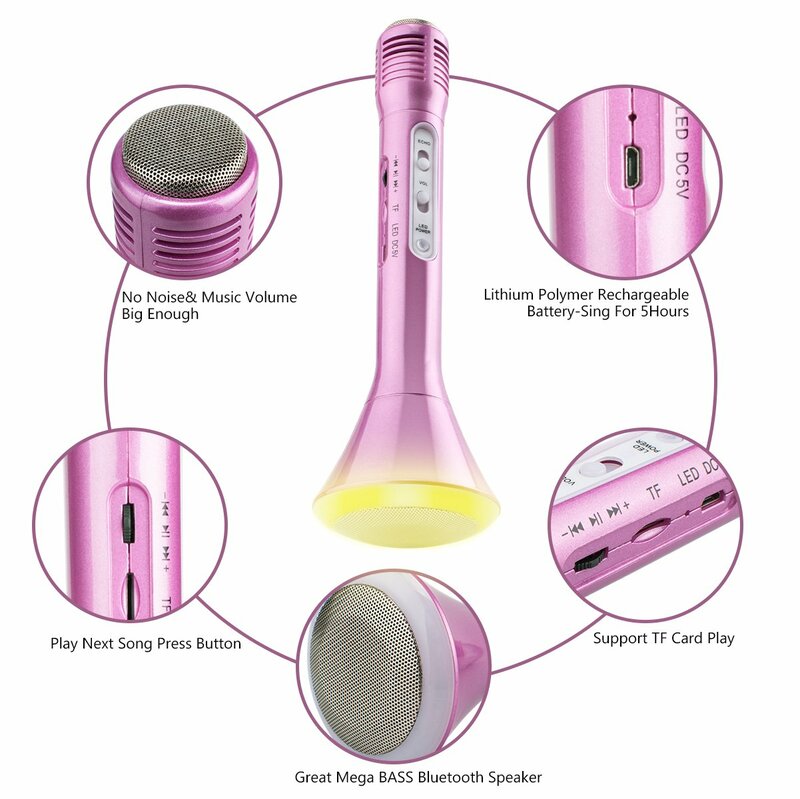 This karaoke machine offers a new, cutting-edge design as it is a singing device that doubles as a speaker and is Bluetooth compatible. This portable microphone can be connected to any handheld device, in addition to a desktop computer. With all of the ways, it can be connected and used the possibilities of what you and your children can do are endless. If you are looking for the perfect karaoke machine for children as young as three years old the Kids Little Pretender Karaoke Machine is one of the best you can find. 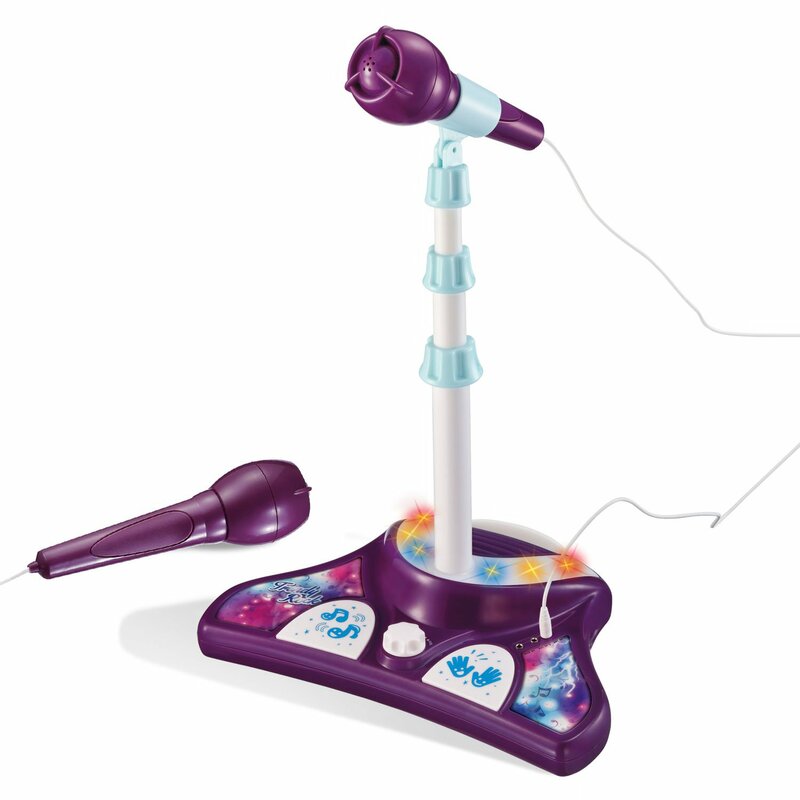 The Kids Little Pretender comes with two microphones and an adjustable microphone stand that adjusts up to 40 inches. The speaker/base comes with a handle allowing for portability. Two foot pedals located in the speaker/base allow your child to add their own special effects to their show. One foot pedal adds tunes, while the other adds applause. Built-in lights are multicolored and flash while kids are singing. The Little Pretender Kids Karaoke Machine is designed for children as young as three years old. The colorful and oversized buttons are perfect for small, toddler-sized hands to easily manipulate. The machine comes with a durable plastic handle that allows young children to take the machine along with them wherever they go. The Little Pretender Kids Karaoke Machine comes with two microphones and individual and master volume controls. With multiple streaming options, including USB-cable, Bluetooth, and FM radio the music choices are endless. 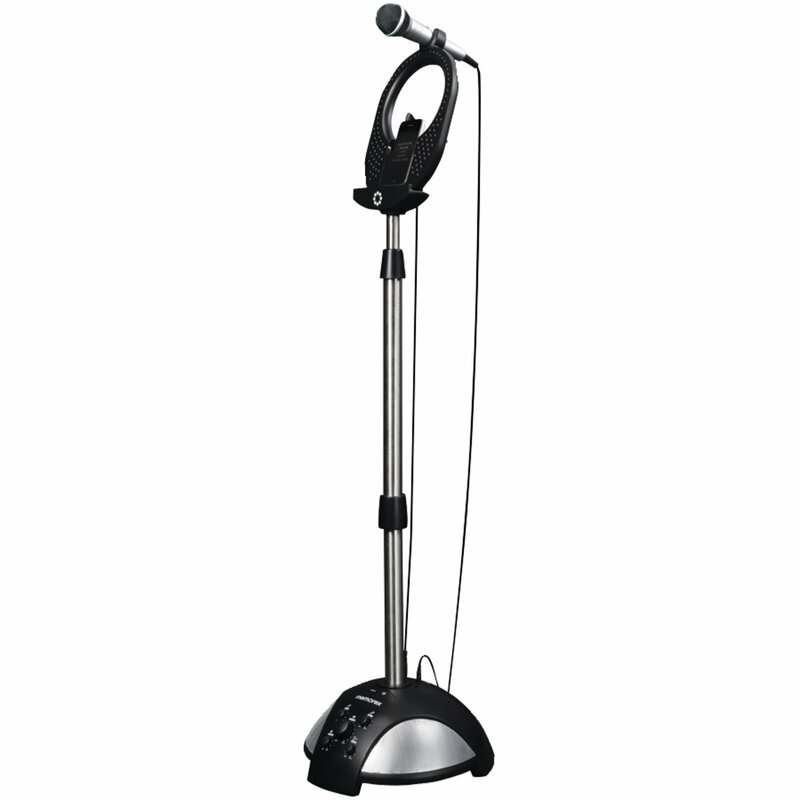 The sleek design of the Karaoke USA Portable System makes this a great choice for a variety of ages and abilities. 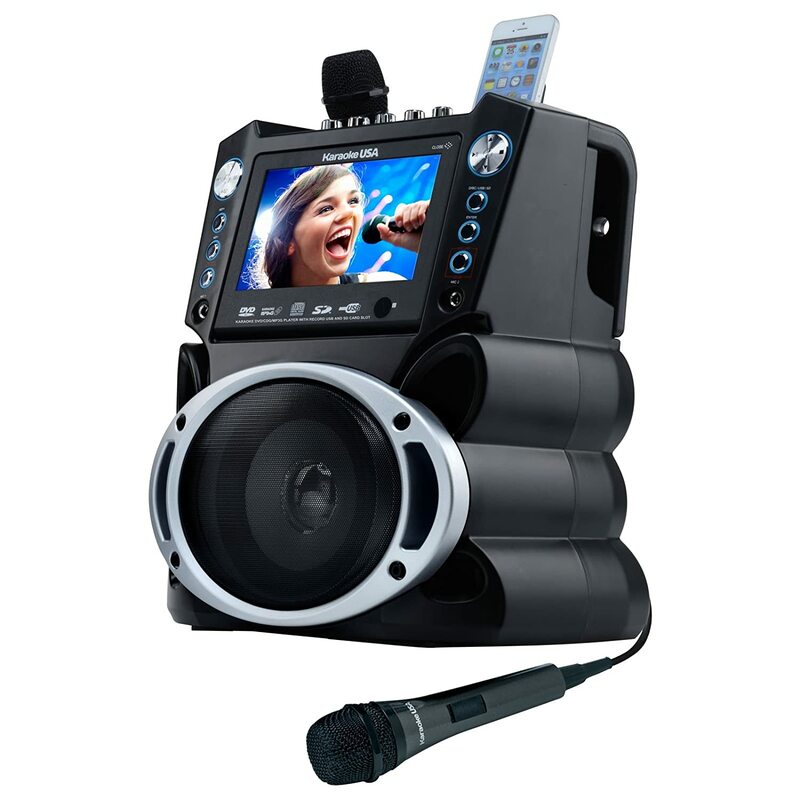 The Karaoke USA Portable System features a beautiful 7-inch digital color screen that displays graphics and lyrics and can be seen from quite a distance. The unit itself comes with two CD+G discs that contain 300 songs to choose from. If you grow bored with the included songs the phone holder allows you to safely and securely connect your device for easy streaming via Bluetooth or cord. For those rising stars, the ability to record themselves, save as an MP3 file and have instant playback is a must-have feature. If you want to wow your kids the Singtrix SGTX1 Karaoke Machine will certainly do it. With the party bundle, you will get the karaoke machine itself, along with a speaker, microphone, and microphone stand, basically everything you need to have a good time. The Singtrix SGTX1 offers gender-switching and Rockstar voice effects, something little kids will find far more entertaining than the ability to sing along. With 300 voice effects, voice correction, and voice enhancement software built into the machine your kids will have hours of fun. With the Singtrix SGTX1, you can use the app to play music or you play YouTube songs through the machine with your compatible device.